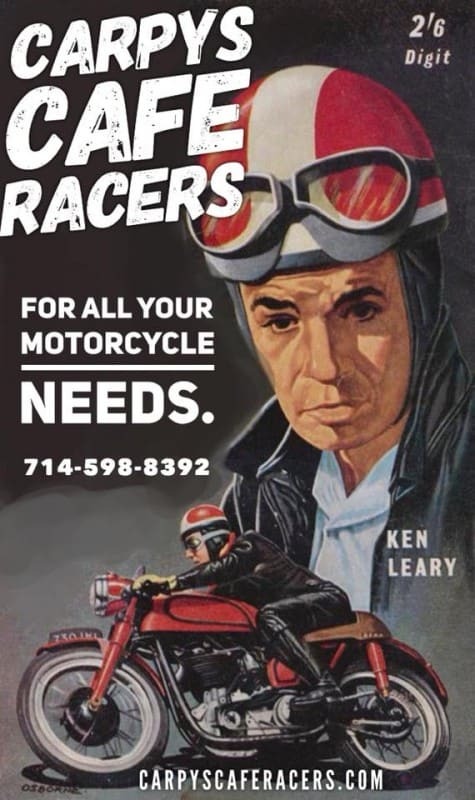 Had a customer come in with an old 1975 Super sport, just wants a few little things changed so he can ride for a while and then sell it, these jobs sometimes can get out of hand as you are dealing with unknown history and previous issues. Knackered exhaust, no side covers JB Weld on things, ugh! 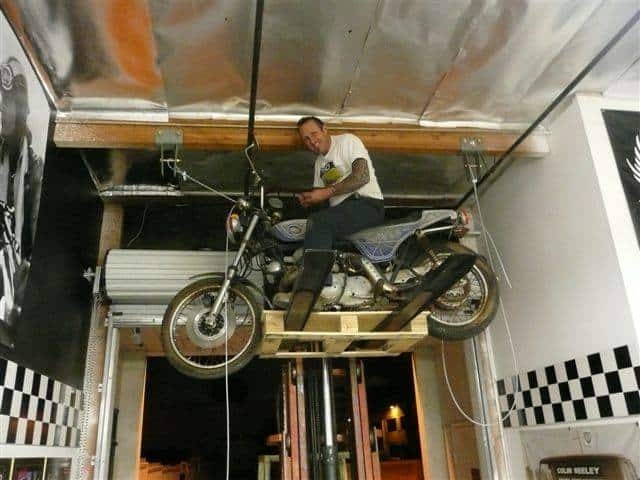 Some of these things do become a big task and would of been better if they left it alone, but, we all have to start somewhere and I know I can help this fella out and get this bike running and looking to how he wants it. 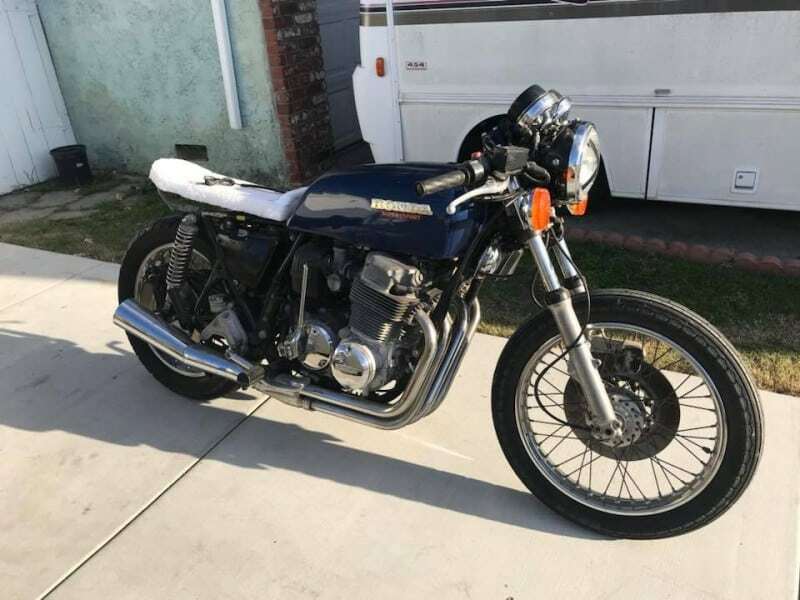 Working on a small income is hard, I have been there but this will be a fun machine and he will get miles of smiles once I have completed the tasks at hand on this Super Sport. 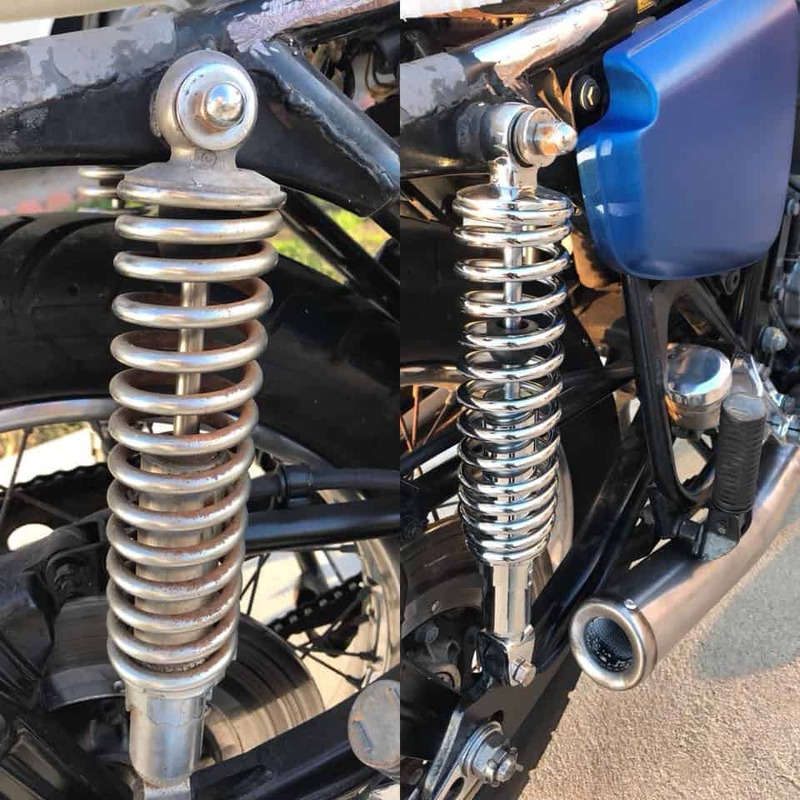 Above is the before and after as you can see the bike had an old Chromed Kerker Muffler on the unit but, it had no Baffle at all and was so loud, it would let off peoples car alarms every time you fired the thing up, so I made a smaller custom one from steel and added a kick up and baffle, it now resonates nicely and looks a whole lot better I think. Above, you can see that I also changed out the rear shocks, as his ones were rock solid and rusty, so now he has some comfort on his machine that will soak any bumps up from the tarmac. 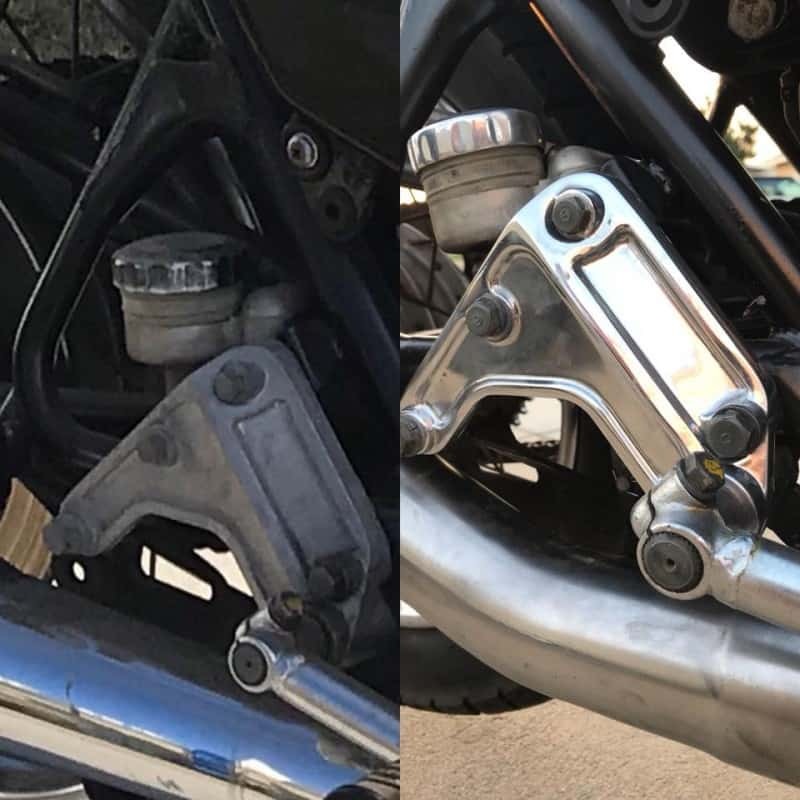 Removed the rear Master Cylinder bracket and Polished it to at least clean the area up a bit as well as polishing the reservoir cap too, makes a difference I think. Above is before and below is how it is now but still more to do as I need to make a steel seat base and then cut some high density foam and upholster it, not sure what color material he wants but will call him once I get to that part of the work that is needed to be completed. I also have to figure out his tail light and turn signal situation as well. 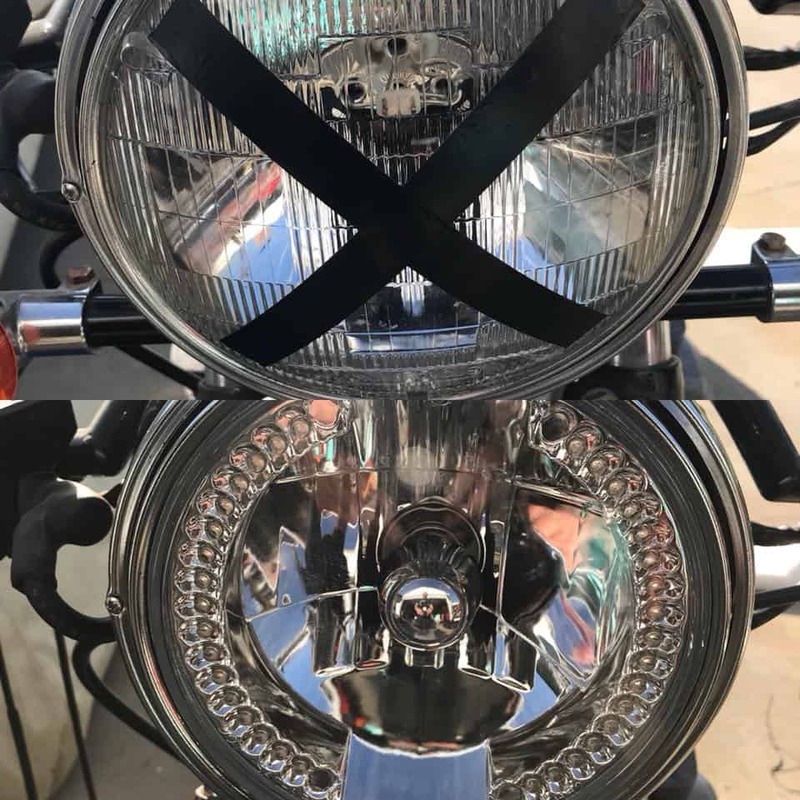 Next up was to remove the stock headlight and fit one of my LED versions that has the internal turn signals, this, not need the old bog ugly stock ones. be seen, be safe, thats the most important thing on a Motorcycle and with the halogen bulb and super bright Amber LED internals signals will make sure people know your intentions on the road. So there ya go, just a few little things I did, am now going to re-route the throttle cables as they said when they fitted them they tended to bind, so will address that next, I made some side covers and they are now on, just need to be painted to match tank when he repaints the stock tank later but so far I have got a lot of the issues out of the way. 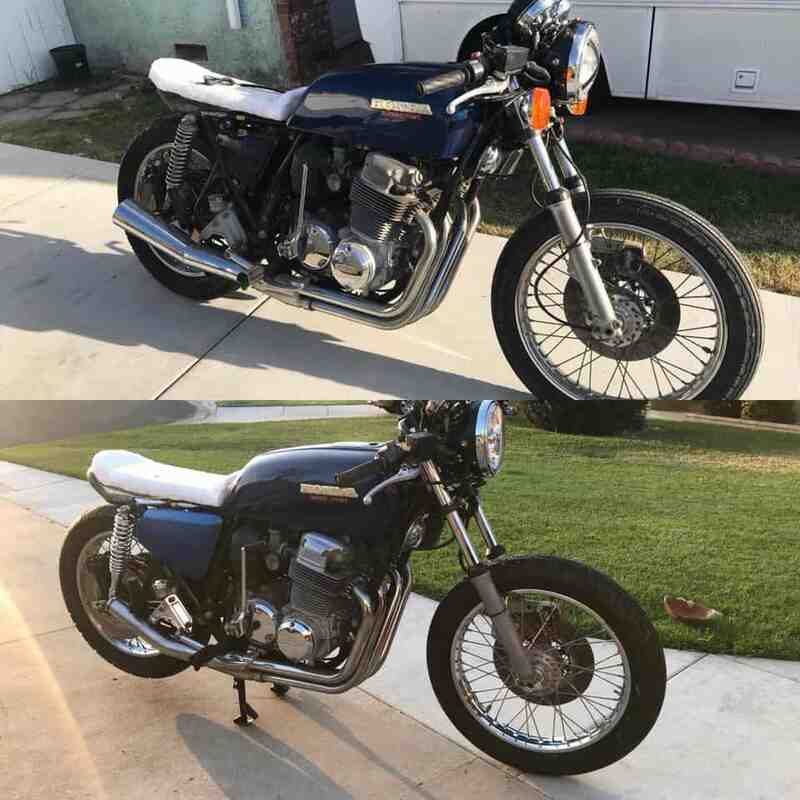 Seat next so hopefully I can do that soon and will keep you posted as to how that looks, if you need any parts, just drop me a dime or text us on 714-598-8392 and we hope to get you fixed up and back on the tarmac as fast as possible. I am here to help and love what I do its been a passion of mine since I was a Kid in Great Britain. Have a Great Wednesday everyone and thanks for reading my Blog. 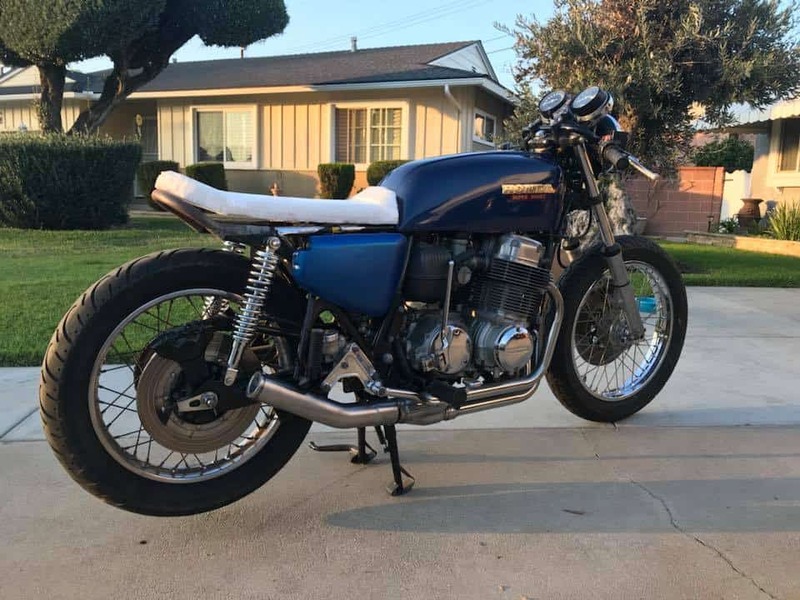 This entry was posted in Blog and tagged 4 into 1 Yoshimura, bonneville, brat, cafe racer, cb550, cb750, cb750f, cb750k, classic, custom, Honda, inline four, parts, sohc, stock, thruxton, triumph.